These workers are a lifeline for Mexico’s economy. 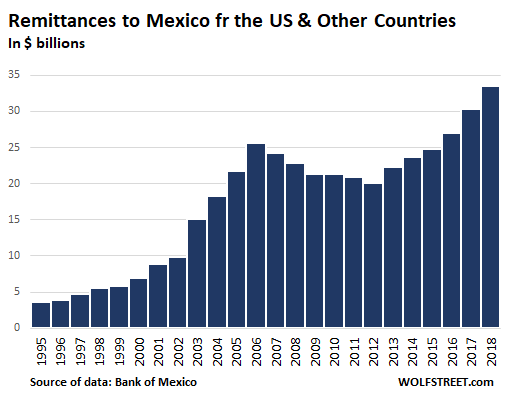 The total amount Mexico received in “remittances” — transfers of money by workers of Mexican descent mostly in the US but also other countries to individuals in Mexico — surged by 10.5% in 2018 to $33.4 billion, the highest figure registered since records began, back in 1995, and beating the prior records set in 2016 and 2017, according to the Bank of Mexico. The cash remittances are a lifeline for Mexico’s economy, accounting for 2.7% of Mexico’s GDP, up from 1.9% in 2009. Most of them get spent very quickly in the Mexican economy. In some Mexican states, they can represent as much as 10% of total revenues. In 2018, they provided more funds than the $29.3 billion in export revenues that state-owned oil company, Pemex, obtained from its exports of crude oil and other hydrocarbon products, and they provided more funds than foreign direct investment in Mexico ($30.7 billion). 104 million transactions were executed, almost six million more than in 2017. Around 95% came from workers in the US — American citizens of Mexican extraction or Mexican citizens in the US legally or illegally. The average size of remittance in 2018 was $322, compared to $309 in 2017. 98% of the remittances were sent by electronic fund transfer. 2% were dispatched by money order ($173 million) or arrived in the form of cash and cash-like instruments ($612 million). Another record was set: the $3-billion monthly threshold was crossed for the first time ever, and twice, in May and June. A number of factors have been put forward to explain the recent surge in cash transfers from Mexicans living abroad, including the improving US labor market, particularly in the construction sector, and a weakish peso. The longest period of growth in the flow of Mexican remittances on record was between the mid-1990s through 2006, at which point the Financial Crisis in the US, the housing bust, and the housing construction bust, and the massive job losses that came with it, slowed down the money flows. Every single year between 1995, the year the Bank of Mexico began tracking the movement of funds between Mexican workers in the U.S. and their families back in Mexico, and 2006, a fresh annual record was registered. Between 2000 and 2001 the total amount sent grew by around 35%, from $6.57 billion to $8.89 billion. In 2003 the rate of growth surpassed 50%. The only thing capable of slowing this inexorable tide of remittances was the Financial Crisis. After the record year 2006, the amount of money sent from the U.S. to Mexico decreased every single year until 2012, by which time the southward flow of money was over $5 billion lower than it had been six years earlier. The recovery began in 2013. Since then, the amount sent each year has increased by 65%, from $20 billion to $33.4 billion. At the global level, around €615 billion of remittances flowed between countries in 2017, according to the World Bank. That number is expected to rise to $640 billion between 2018-2019 million. Mexico received 5.1% of the world’s total remittances and was the fourth largest recipient, behind India ($65.3 billion in 2017), China ($62.8 billion) and the Philippines ($32.8 billion). BBVA Bancomer predicts that Mexican’s remittances will continue to grow in 2019, albeit at a slightly slower pace — 6% instead of 10% — to about $35 billion, almost exactly 10 times the amount they brought in in 1995, the year records began. By Don Quijones. I wonder what comparable remittance levels from European immigrants in the US was during 1800’s. Banking system was not as sophisticated. Technically, illegal aliens can never become part of the local population and will always exist in the shadows of the legal system. Couldn’t wire transfer dough then. So….. let’s start taxing the remittances for the wall. Problem solved. and paid for/subsidized in large part by the US Tax Payer. The Money Order can ONLY be bought with CASH, no credit card. This is a very inexpensive way to send money out of the US. There is no record keeping, no tracking. day out of the US with no tracking whatsoever. No Identification is requested or required. Not true. Securing a USPO Money Order over $300 requires paperwork specifically stating who it is intended for and why you are sending it. ID is required. This is part of the anti-money laundering effort. Filling out the page long form for every $300 would be very annoying if you were sending out large sums. Just standing in line in a local Post Office is enough to make most people avoid doing this on a regular basis. I honestly doubt anyone, even in a large city, could visit 20 in a single day and do an exchange. Likewise, while the bureaucracy turns slow, sooner or later someone is going to come ask why your name is on multiple forms from different locations sending funds out of the USA. Even this old codger can do an email bank transfer. I’m sure these folks have lots of ways to move money home, including taking currency on visits. Plus, at 3.8% unemployment the work being done is pretty much work that wouldn’t get done if it was up to US citizens. We have pretty big gardens at home and I would absolutely hate to work in the fields all day. It’s low paying and back breaking work. In BC it’s East Asians working the fields. They get together, pool their money, and buy a home. Rinse and repeat and get ahead…get wealthy. My sister, when she lived in Kirkland WA, lived next door to a house bought by Mexicans who worked in a Mexican restaurant. They were awesome neighbours with real family events that multi-generations attended. They had a lot of fun as well as worked very hard for their wages. Gringos love to vacation in Mexico for the cheap prices and fun to be had. I don’t see what the big deal is when Mexicans send their wages home. Wouldn’t you? It works both ways. The work wouldn’t get done at the wages offered. The US born children of the immigrants are eligible for benefits so the taxpayer is subsidizing labor costs. The wages sent out of the US don’t circulate in the local economy. What benefits the consumer and employer doesn’t always benefit the taxpayer. KGC your answer is completely false. Not true, at least in my experience. I have bought USPO money orders regularly and never had to provide ID or to whom it was ordered payment. The amounts were always in excese of 300 dollars. I wonder how much of this money has been skimmed by transfer fees etc? they are maybe a third of the cost at turn of century. There is a pdf /ebook search “us mexico remittance corridor” from a now outdated 2004 that charts some of that, plus that by the end of that study somewhere around 80% of those remittances were by electronic transfer not money order, which I expect continues to today. I imagine DQ and Wolf are going to have their hands full moderating this topic :-l . Why people are arguing over the paperwork needed filled when there are a hundred other ways to move funds I don’t know, I think in general that unrestricted flow of capital is a good thing – no one enjoys being hassled or monitored or controlled, but even there you will have shadow and official economy proponents. The arguments people have should focus instead on the actual laws of their own country as pertains to residence, work and so on I think, and what and why they think any is better or not, all of which I very happily will only read. To tackle the subject by fixating on a point of intercept, i.e. using data from transfers as point of departure to try to enforce current laws, in pragmatic terms is unlikely to solve much beyond demonstrating a fleeting vindication of authority. I be quiet now or risk wrath. Western Union and MoneyGram take hefty fees. It is all hidden in the bogus currency exchange rate they use, which is vaguely referenced in the fine print that takes an electron microscope to read. If there were a crackdown or “wall tax” added, they would just use other options. Small shops would pop up using services like Transferwise or even Bitcoin to move money. PayPal works in Mexico, too. There are a few countries where remittances in compose up to around 30% of gdp, Pew Research has one article on that. France is a bit of a surprise being high on the list of volume until you look at its net of remittances in and remittances out, which is close to zero. has figures and a breakdown of destinations by country, just choose whichever one. I’ve been spending some time in Arizona since 1985 and most of the Winters since 2006. I met some Mexican Americans, legals and maybe a couple illegals. I found them all to be honest, very hard working, and dependable. I’ve always gave praised to them for their worthy towards the people back East, Michigan, where many are weary due to the Media news feed according to their choice of CNN vs FOX. This Summer and Fall I had a bad experience with 3 break-in from the same bad illegals to the cost of $3000. I still will defend the Mexicans in this Country regardless of these bad actors. The only problem I’ve gain from this experience is that illegal bad Mexicans get the same Constitutional rights as citizens do, appeals and jury trials, all to delay release of stolen goods to the rightful parties. Maybe instead of a wall we need to help build prisons at border towns to house these bad actors, Mexican prisons are not a good place to reside. I believe all people who support illegal immigration should have the integrity to volunteer to a additional 10% tax to pay for the additional public services that illegal immigration requires. Can’t we just take that out of the Social Security payments illegals make and will never collect? They more than pay for themselves in the fact that they pay into Social Security, Medicare and so on under fake SS numbers, just like at Trump’s Mar A Lago, that they will never be able to recoup. You will retire on their labor. For as much controversy absurd, the only thing that can save the dollar is to continue rolling around the world. The dollar never going to miss, is the reason for the Central Bank to make money to infinity. My friend has been telling me for years we need to tax the money transfers to certain countries. The IRS should start to implement some kind of a standard for a tax to certain countries. We can’t go to the bank& put $5.00 cash into a account without our name on it. Something should be done. The downside would be US tourists being forced to pay the transfer tax every time they go on vacation and spend money outside the US. The US also sends dollars to Mexico, it buys more from it than it sells to it in trade. There is a difference between maintaining a privileged position and just assuming your own compatriots are going to do the hard work needed to maintain it. All countries are like this, they think they deserve both the butter and the milk and live in contradiction. Every now and then they try to tackle the contradiction and generally make it worse.That is the nature of politics, it is an arbitrage of differences, an attempt at or use of. In the same way that tourism increases prosperity by bringing in money from outside sources, immigrant labor decreases prosperity by cash outflows to foreign countries. The stupidity of supporting immigration policy that decreases wages and lowers over all prosperity is truly hard to fathom. It isn’t hard to fathom, no one defends the kind of labour immigrants take up, society is trained to expect a higher position, and social entitlement is the welcoming ideal to that, that by its nature is supposedly non-discriminatory. You could deny that entitlement to foreigners, many countries do, but you might equally then have all possible work foreigners do carried out over the border and sold to the US from abroad. There you will have a smaller more compact local economy that must somehow compete to buy in outside production if it wishes to maintain its current level of consumption . It is a question of format, the US currently enjoys great wealth from its position at centre of global trade and enterprise. That position of wealth, once taken for granted, can be its own undoing , as it becomes expected and the effort needed to produce that wealth is hidden from the eyes or understanding of the consumers who benefit from it. Hence the contradiction that arises via a resulting belief in entitlement, people do not even consider they are acting out of a sense of entitlement. 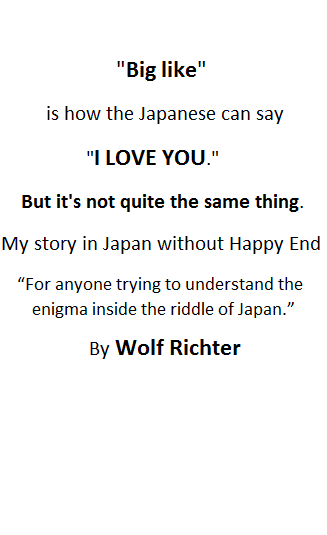 This can lead to moral degradation, disconnection in interpretation, eventually confusion and a poorly coordinated reaction. So immigration and how it is handled is only one indicator of the actual state a nation finds itself in. The only answer to all that is the one that works better than the rest, but it must be chosen beforehand without comparing it in practice to those not tried, which is one reason tradition is relied upon . As we use past observation and subjective values to take our position though , ultimately it will be a battle of those positions, one that sometimes are so entrenched that conflict arises. That unfortunately is the last arbiter, who is left standing, politically, financially, or otherwise. None of that provides an outright answer, but hopefully it will help draw a slightly clearer picture from which to contemplate from. I am certain there are ways that integration/de-integration can be handled that are acceptable and understandable by society on all sides, and as a whole. I am not certain they will end up implemented though. Who will perform the myriad services needed by tourists? From cleaning the rooms, laundry, cooking, serving etc. Who was doing it at Mar-a Lago, which unlike the typical hotel could have afforded legal workers? After the fees were doubled to 200 K, it could have afforded white Anglos ! But in general Americans are not going to do the above or pick lettuce. That is a tired and inacurate argument. Immigrants have taken more than just domestic service jobs. They have taken allmost all construction related jobs which used to be great union jobs. Look at your local utility companies and see how many immigrants are holding those 6 figure jobs. The only people who benifit from illegal immigration are the corporate bosses. The American worker has been sodomised by illegal immigration, and is too damn stupid to realize it. You mean legal immigrants with qualifications and work ethic who pay taxes and fulfill their social obligations? Go to Bangalore or Shanghai and see how many Americans work there. I suspect the bile being spewed in this comments section is reserved for ALL immigrants, ‘cos you know, they look different. I gave my neighbor a contract to paint my house exterior. He only hires citizens/legals. One of his employees showed up at my door at 9 a.m. reeking of alcohol. I sent him back. My contractor is now trying to bail the second one out of jail. All his jobs were held up for a couple of weeks. At this point, he will hire anyone who doesn’t do alcohol/drugs and shows up on time to finish the job. So will I.
I find it amazing that governments at all levels in the USA turn a blind eye to money movements like this. I wonder how much of that money is ‘illegal’ – from people illegally in the country, not paying tax on income, or from illegal activities? Yet, just try be an American overseas. How many forms do you have to file and laws do you have to be aware of? Some banks, insurance companies, and brokers will not do business with you if you are an American. Too much reporting that has to be undertaken. Go to their web sites, start filling in the form, and they ask you if you are an American. Yep, one set of enforced laws for American citizens and another for people illegally in the USA that don’t get enforced. I wonder what percentage is drug money?